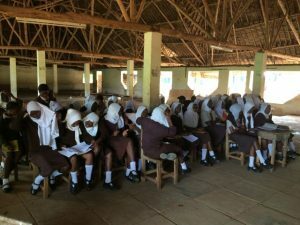 From June 2016 onwards the secondary Girls School in Kwale – Kenya with 800 students, has become fully independent of external water deliveries. 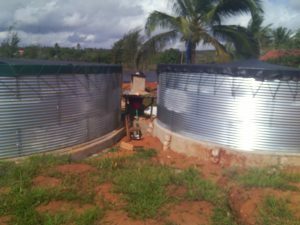 To reach this goal, AAWS implemented a large scale rainwater harvesting installation delivering at least 500.000 litres of fresh water per year for human consumption. 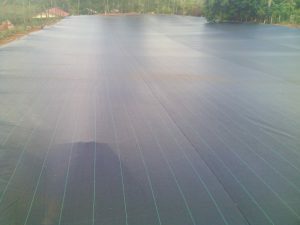 At the same time up to 2.500.000 litres of water is captured to be utilised in the gardens of the school. Water for human consumption is collected from 11 building roofs situated on the school compound. Once collected, the water is purified using self-cleaning vortex filters after which the water is routed downhill and stored in two large silo tanks with a total volume of 500.000 litres. Upon demand, the water is then purified from sediments, odours and dangerous bacteria/viruses using a UV WaterBox. 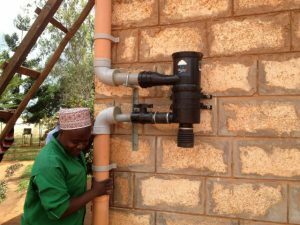 At that point the quality of the rainwater is improved such that it has become fit for human consumption. urface runoff is also captured on the entire compound. Gutters are constructed to route the water downhill. After filtration the water is stored into two large foil tanks. The volume of these tanks is massive. We estimate that on yearly basis at least 2,5 million litres of raw water per year can be collected to be used during the crop season. The vegetables once harvested from the garden, form an essential part of the meals for the students at the Girls School in Kwale. Interested to know more about this project? Let us know!